Ask fellow campers about "Stagecoach Stop RV Resort" and nearby attractions. Question: The satellite map shows this in a congested commercial area with the county jail on the other side? Answer: Yes, but when you're there in person you don't notice any of it because of the layout, and the road noise is surprisingly low. It's a bit of an oasis within the commercial area. The primary view is the mountains across a field (the terrain slopes down towards the mountains). The jail is not visible (blocked by the park's maintenance building and the storage lot). I lived in a house on the other side of the aforementioned field for 12 years -- it's a safe area and there's nothing to worry about. Nice, safe park. Location was excellent for our purpose which was to visit friends. Close to everything, food, etc. Not scenic or anything, but clean and safe. We camped at Stagecoach Stop RV Resort in a Travel Trailer. nice park with easy access for big rigs. Wonderful view of mountains. The only problem was the internet. Mail only. For the price they should improve the internet. Very kind check in. We camped at Stagecoach Stop RV Resort in a Motorhome. We chose this park because of the convenience of being between ALB and Santa Fe. The park is clean and the two fenced pet areas are nice. There are several full timers throughout the park. The park is arranged for all pull through sites and a separate parking spot for your vehicle. We camped at Stagecoach Stop RV Resort in a Fifth Wheel. Take a trip on the Turquoise Trail and visit the Tinkertown museum, very cool! Madrid is a nice, small town with multiple shops. A visit to the Meow Wolf museum is well worth the time and price. Awesome! We really enjoyed this park and we are so happy we found it on this trip. 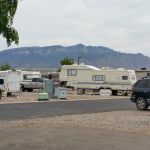 It truly is the best RV park we have found in the Albuquerque area. Sites are concrete pads with paved road throughout the park. Super clean and truly amazing views of the Sandia Mountains. A quiet country setting but convenient to all shopping & city sights. The staff was very nice and helpful in the office. We will definitely stay here again. We camped at Stagecoach Stop RV Resort in a Motorhome. Go have breakfast at The Range Cafe in Bernalillo. Saw comments regarding tight for motorhome. I must say we don't have any issues with getting around including our tow that we don't unhook till parked at site. In our opinion, this is the "go to" park while in the ABQ area. People working the park including ownership will do what it takes to make you feel comfortable during your stay. Close to everything & easy on/off of I-25. Will always be here in in the area! Highly recommended. We camped at Stagecoach Stop RV Resort in a Motorhome. Very clean and the management will find a place for you when you need it and worked with us for storage when we had to leave town for 10 days; also let us use their refrigerator/freezer in lodge upstairs while we had our rig in storage. Has a small dog park separated for large and small dogs if you want to separate them. Nice spots with grass in some. Shade trees thru-out. Tow cars have easy side areas to park.Definitely will go back there. Great park with favorite stores across blvd. We camped at Stagecoach Stop RV Resort in a Motorhome. Great central location near freeways in Rio Rancho. Nice park and close to attractions. You need to disconnect tow vehicle if you are 40'+. We camped at Stagecoach Stop RV Resort in a Motorhome. We booked our stay here expecting a big rig friendly park and were extremely disappointed. The park is clean and concrete with nice shrubbery all around, but the roads are way too tight to accommodate large rigs with or without toads. There are large trees placed on corners that make it extremely difficult to navigate the roads in the park. There were only a few sites that would accommodate larger rigs. The pull-though site we were given was so tight we had to back out to exit the park and there a number of other larger rigs placed in sites that were clearly too tight. They clearly did not design this park with larger rigs in mind. If you are driving anything longer that 40 feet, you should approach this park with caution. We camped at Stagecoach Stop RV Resort in a Motorhome. Nice stop and convenient to ABQ. Easy walking to nearby major retailers. Back right corner affords the better view of the Sandia Mts. The other side of the park borders a concrete pipe plant. Interestingly, the premium sites face away from the mountains. Lots of amenities. Very friendly staff. Very quiet. No road noise. I would stay again. We camped at Stagecoach Stop RV Resort in a Motorhome. Stay here when in the ABQ area. This park is adding more & more to help make it the best rv park in the ABQ area - period! Clean, Friendly Helpful Staff who go out of their way to help. Within walking distance to most every shopping need! We camped at Stagecoach Stop RV Resort in a Motorhome. Bernalillo is a fast growing small community with plenty of good restaurants. Rio Rancho is the fastest growing town in NM. All the shops & restaurants in close proximity. We stayed here for a month and found the park quiet, clean and well managed. We are glad to call this park our "Rio Rancho home". The mountain views from the premium spots are awesome. We camped at Stagecoach Stop RV Resort in a Motorhome. Having read previous reviews, I asked the park very nicely for a site on the view side and a premium site. For $5 extra that's what we got, a full on view of Sandia Peak on the "good end". At the other end of the row, the view is of a concrete pipe yard, not too good! The park is clean and well cared for. Sites have concrete pads, with an extra one for vehicles. Our Golden Retriever enjoyed the dog park and its numerous users. Distance from the 25 freeway means it is quiet. Good location for a exploring the entire area. We camped at Stagecoach Stop RV Resort in a Travel Trailer. Walk, run or ride on the 16 mile long Bosque trail, trails in the Willow Creek area (close by) or at the Tomaya Resort. Albuquerque is very bicycle and dog friendly. Found the cost a little high but it is a nice clean park with ashphalt roads. Wifi was good as were the hookups. Probably wouldn't stay here again. We camped at Stagecoach Stop RV Resort in a Fifth Wheel. We're two weeks into a month stay here (just started full-timing! - we lived for 11 years in a house across the field and my parents would stay here when visiting). We are very pleased with this park. This time of year, almost everyone is long-term, but it's a quiet, friendly bunch. Most we've talked to are here for medical procedures. There are beautiful views of the Sandia mountains. The park is set far back from the highway, so the noise level is low. The owner and crew are super friendly and their dedication to the park is reflected in the good upkeep. Bathrooms are squeaky clean. The hot tub is inside a small building and usable all year. There's also an outdoor pool (but too cold now). Clubhouse has more amenities than most. Spacing between sites is good. Sites are level - paved with gravel in between. A few premium sites have artificial grass. The dog park is a good size and has been split into two. Walmart, groceries, etc are nearby. Wifi is slow at times of the day, but that's to be expected. We mostly just rely on our Verizon. Cable TV is good. We paid $650 for a month, all utilities included (otherwise $39.50 is the daily rate for just about every discount club there is). This is one of the best park experiences we've had and will always stay here when we're in the area. 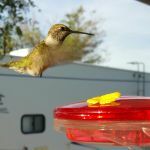 We camped at Stagecoach Stop RV Resort in a Travel Trailer. Santa Ana Casino is just around the corner. Check out the Coronado Historical Site just east of the casino on NM 550. There are ruins of structures from Coronado's expedition. Great hikes are 10 minutes away in the foothills on the other side of the interstate in Placitas. For good dining, check out The Freight House (great tap beer selection) and The Range in Bernalillo. Grab a breakfast burrito at Blake's Lotaburger (a New Mexico favorite). Park is very clean and layed out well. Spacing between sites is adequate. Convenient to shopping, Walmart is close enough to walk to. My first time here, but I will return as my son and his family live in Albuquerque. Unlike the parks on 9 Mile Hill next to I-40, do not charge for electric for weekly stays. Management is very accommodating with all my requests. Agree with most other reviews. 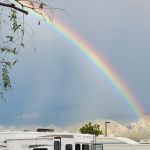 We camped at Stagecoach Stop RV Resort in a Motorhome. Shopping and restaurants were close and plentiful. Within walking distance to Wal-Mart and McDonald's. Close to other chain restaurants and fast food establishments. Also PetSmart is close by. Convenient to Albuquerque and Balloon Fiesta. Rio Rancho is a newer & growing suburb so lots to do there. WalMart, Albertsons, & Plenty of Shops & resturants.. All within less than 1 mile! We walked to them. Big rig friendly. A few rental cabins. Pool. Laundry. Right across street are restaurants, gas and shopping. The RV park is very convenient to Walmart, restaurants, grocery stores, and most anything you might need to pick up while traveling. Visit the local shops in the area. No trip to the area is complete without sampling the New Mexican cuisine and the green chile. Local favs are La Salita, Range Cafe and Sadies. Albertsons and Walmart very close. Are you affiliated with Stagecoach Stop RV Resort ?